Scroll mouse across picture for better maze viewing. If you see a star, click on it to see the hint! Local history became the theme in 2004 and 2005. Did you know that Murrysville is the site of the first commercial natural gas well in the country? In 1878 while drilling for oil, a crew of men hit a gas pocket – a very large gas pocket that spewed into the air. It was quite an attraction and drew thousands of people to see it. One evening, in 1881 visitors carrying lanterns came to see this phenomenon. Well, they got too close to the stream of natural gas and the flame from the lanterns caught the gas on fire. They say the initial flame was so large that it could be seen from Pittsburgh (about 20 miles away!) The flame burned for over 1 ½ years before it was extinguished. A local Boy Scout Troop’s efforts gave Murrysville a chance to be listed in the Guinness Book of World Records. This group created the largest living sign in the world when they planted evergreen trees on the hillside just South of Rte. 22 above the present day Community Center. This inspired our 2004 corn maze. 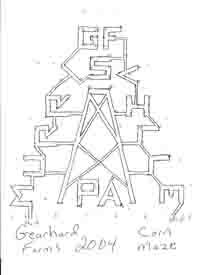 The odd tilt of the “Y” in the maze was to symbolize the tree sign “Y” as the tail of this letter in the tree sign was situated so it points to the site of the gas well. NOTE: The Murrysville Historical Society still offers for sale a black and white post card showing the tree sign with its historical significance noted on the reverse side.